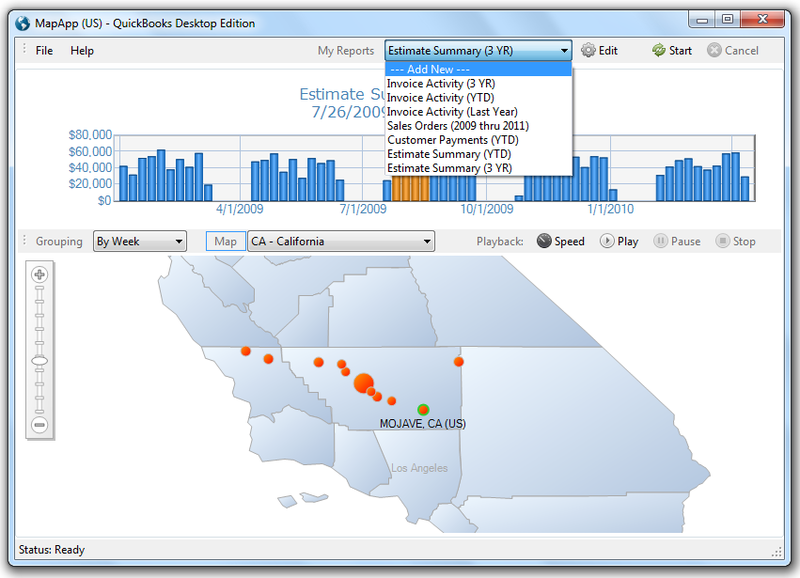 Map your customer activities from QuickBooks ® for a bird's eye view of your business's past and present geographic footprint. Assemble, run and revisit your custom report lineup without overnight synchs, coding or the privacy risks of web-based applications. Uncover location-specific trends and patterns with built-in drilldown reports, map playback and other innovative features available only with MapApp. See where your business is happening with MapApp, a user-friendly spatial analysis solution built exclusively for use with QuickBooks ®. Keep tabs on product movements and customer activities anywhere in the United States. Spot and investigate patterns faster with innovative features like playback and drilldown. 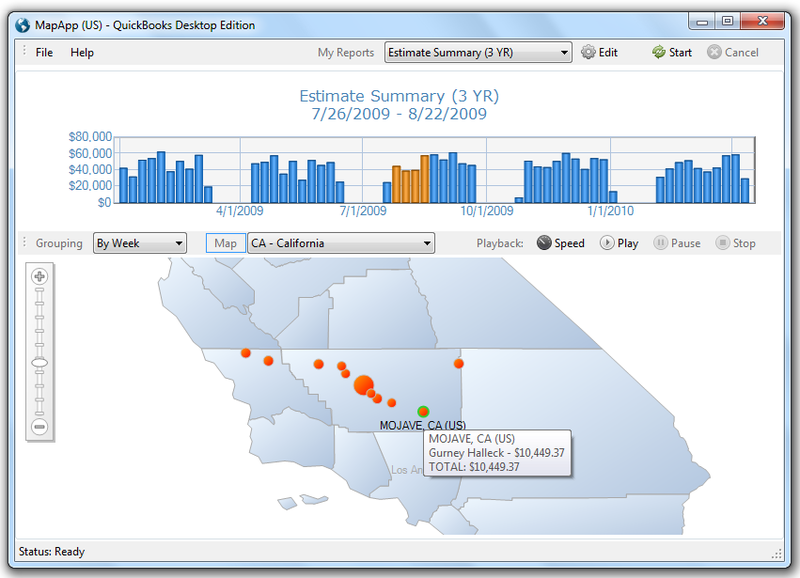 Assemble, run and rerun an unlimited number of customized spatial reports. 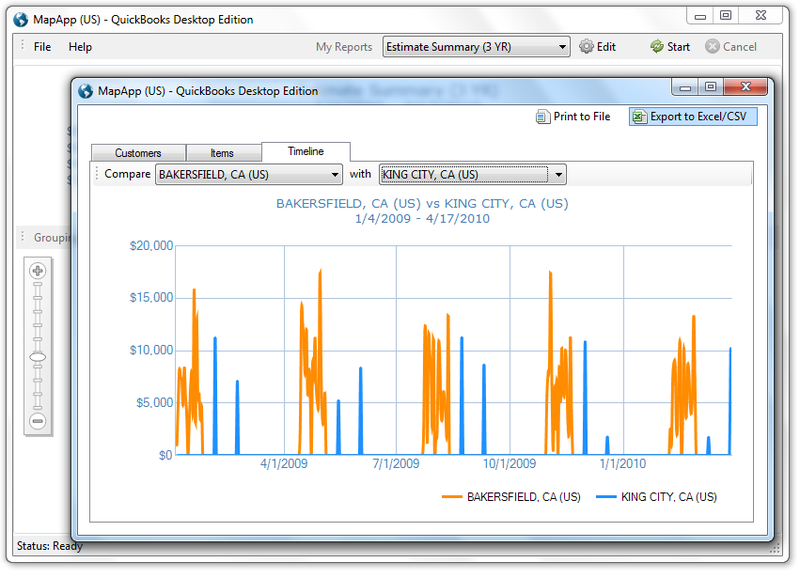 MapApp reads customer information and activities from QuickBooks ® into interactive, geographic reports. Specifically designed for fast spatial analysis, MapApp is ideal for measuring and investigating your business's geographic footprint over time. MapApp lets you decide what to analyze and automatically stores the reports you create for future use. 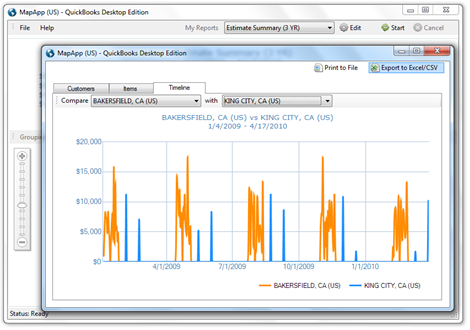 Reports always reflect up-to-date QuickBooks ® data and feature a variety of innovative analysis aids such as drilldown summaries, on-the-fly filtering and map playback. MapApp installs in minutes and includes a straightforward walkthrough which will help you connect with QuickBooks ® and begin building spatial reports. There's no limit to how long you can evaluate MapApp, but reports run during evaluation omit a percentage of detail. You can later unlock full detail for your reports by purchasing a a user's license. To purchase a user's license for MapApp, just click the checkout button below. Following your secure payment, you will receive a purchase confirmation and a License Key by email. Enter your License Key when you start MapApp to unlock full functionality. Updated components and interfaces. Replaced census-derived state maps with a more flexible geocoding overlay. Added base maps for each state, DC and contiguous US. Improved report filtering capabilities.